Best wishes this holiday season from all of us at A2A! As Roxanne Razavi, Ph.D. says in her introduction to the research at hand: "What is the best way to spend resources to protect ecosystems? How do coordinated efforts over space and time compare to local planning? Are large lump allocations of funds more effective than small allocations of funds over long periods of time? These are questions that we face as managers and custodians of the Finger Lakes. Earlier this year, an important study by aquatic scientists posed these questions and revealed that the most efficient way to spend conservation dollars – when ecological connectivity is at issue – is at large spatial scales. Read more about their case study on migratory fishes in the Great Lakes below, and check out Fishwerks, the exciting tool they’ve developed to improve fish habitat." "Habitat destruction along routes taken by the world's migratory birds poses an increasing peril to these long-distance fliers, with a vast majority crossing terrain that nations are inadequately protecting, according to scientists. The researchers said on Thursday they tracked the migratory routes, stopover locations, breeding grounds and wintering locations of 1,451 migratory species and assessed about 450,000 protected areas like national parks and other reserves. They found 1,324 species, about 91 percent, journeyed through locales that were not safeguarded from threats like development. "This is important because migratory species cover vast distances and rely on an intact series of habitats in which they can rest and feed on their long journeys," said conservation scientist Richard Fuller of the Australian Research Council's Centre of Excellence for Environmental Decisions (CEED) and the University of Queensland. "If even a single link in this chain of sites is lost for a species, it could lead to major declines or even its extinction." The birds traverse many different countries where conservation efforts vary. The problem was most acute in North Africa, Central Asia and along the coasts of East Asia. Countries in these regions maintain relatively few protected areas, and existing ones do not overlap sufficiently with the routes of migratory birds. For small birds, the opportunity to feed and build up energy reserves for the next leg of their journeys is essential for survival, said conservation scientist Claire Runge of CEED, the University of Queensland and the University of California, Santa Barbara. "Loss of these critical sites means they no longer have the energy needed to make the journeys, and they simply perish along the way," Runge said. The bar-tailed godwit is a bird that migrates from Arctic breeding grounds to Australia and New Zealand. Along the way, the birds stop to rest and feed at Yellow Sea mudflats in China, North Korea and South Korea. "Many of these critical sites have been lost to land reclamation owing to urban, industrial and agricultural expansion, and the species is undergoing a rapid decline," Runge said. Runge called for creating new protected areas in key locations, improving management of existing protected areas and coordinating conservation actions across international borders. "Common migratory species have been lost in the past, for example the Eskimo curlew, and our world gets poorer every time we lose a species," Fuller said. The research was published in the journal Science and can be found here. (Reporting by Will Dunham; Editing by Sandra Maler)"
We are looking for someone to join our team for the summer to coordinate our A2A Trail project. Apply by Monday, May 11! 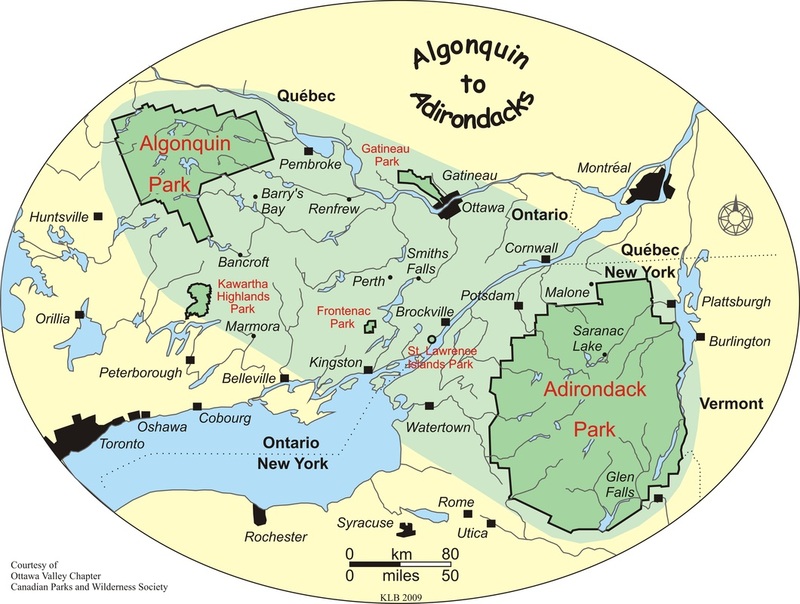 Context: The Algonquin to Adirondacks (A2A) Collaborative is a multi-national (Canada, United States, Indigenous nations) network of partners working toward ecological connectivity and conservation in the A2A region. Apply by: Monday, May 11, 2015 at 5:00 p.m. Application process: Please email your CV and cover letter to A2A Trail Committee chair, Richard Grover, at rwgrover2 [at] gmail.com with the subject line “A2A trail project coordinator”. Algonquin to Adirondacks (A2A) Collaborative values the contributions that individuals who identify as members of marginalized communities bring to our organization and especially welcomes applications from visible minority group members, women, Aboriginal persons, persons with disabilities, members of sexual minority groups, and others who may contribute to the further diversification of ideas. Please indicate if you consider yourself to be a member of one of these groups and would like to be considered as such for the purpose of this hiring process. We are happy to share the proceedings from Algonquin to Adirondacks Collaborative's 2015 Partner Meeting attached. They include our President's message, guest speaker Michelle Kanter's talk, our workshop on collaborative conservation planning, and partner organization updates. A2A's 2015 Partner Meeting was made possible by support from Sustainable Eastern Ontario. A2A is also supported by the Ontario Trillium Foundation, the McLean Foundation, the OMNR's Species at Risk Stewardship Fund, donors, and members. Thank you to everyone who has supported A2A with their time, membership, donations, and collaboration. View and download the proceedings HERE. With this notice all A2A members and partner organization representatives are officially invited to the Algonquin to Adirondacks Collaborative’s 2015 Annual General Meeting on Saturday, March 28th, at the Brockville Museum, 5 Henry St, Brockville, ON (613) 342-4397. Registration will start at 9:30 a.m., program 9:50 a.m – 3:00 p.m. Lunch will be provided. What’s on tap this year? As a collaborative, A2A is looking for the best ways to involve partners in decision-making and do the work of conservation and connectivity in a way that embodies respect, equity, and empowerment. With a whopping 39 partners, it’s important to get it right! How do we best to facilitate that discussion? We’ve invited Michelle Kanter, the Executive Director of Carolinian Canada Coalition (CCC) since 2003, to be our keynote speaker this year. The CCC has had a lot of successes working with partners on conservation. Michelle will help us learn what has worked and what hasn’t in advancing a collaborative conservation strategy in the large Carolinian ecoregion of southern Ontario. Like A2A, the CCC is a registered charity, and like us, ecoregional in nature. Its territory stretches from Toronto to Windsor, encompassing the Carolinian Life Zone of southern Ontario. Also like A2A, the CCC brings together diverse sectors, people, and governments to collaboratively conserve unique habitats and promote green infrastructure. After Michelle speaks, you will have a chance to ask questions and help hammer out the best structure for the A2A Collaborative to work with partners. What have A2A partners been up to? Next there will be a chance for partner organization representatives to briefly showcase their projects that further the A2A Vision and Mission. After lunch we will have the A2A Business meeting for members—your chance to participate in choosing new directors for 2015-2016, learn about the accomplishments of A2A over the past year, review the Collaborative’s finances, and set priorities for the next year. How do I sign-up? Since we will be providing lunch, we ask you to please register in advance by emailing Lilith Wyatt, A2A Coordinator, at coordinator@a2alink.org or phoning 613-659-4824 by March 20th to let her know you will be attending, and please include any dietary restrictions. Spring is right around the corner, and just in time, here is our spring newsletter! Find out about our AGM on March 28, a pipelines update, the Thousand Islands Land Trust, and a pilgrimage trail from the Adirondacks all the way to Algonquin Park. Check it out now to see our beautiful new design and these great stories!